Event Tickets Printed on Thick 16pt Card Stock with Choice of UV High Gloss or UV One Side. 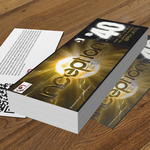 Sequential Numbering and Perforation Options Available. Available in increments of 250, 500 1000 and 2500. Available with UV, or UV 1 Side only. 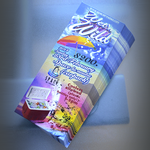 Custom printed ticket services from Elite Flyers are among the most affordable and premium ticket printing services found online. Since the inception of our company, we have printed countless custom printed ticket orders for a wide variety of clients. Tickets are must-haves for concerts, VIP access, fundraisers, raffles, sporting events, and any other event or service which must have controlled access & accountability. The tickets offered for online ordering are printed in full color on 2 sides, measure 2.125” x 5.5” in size and can be individually numbered in 1 or 2 locations. We understand that in certain cases, one may require advanced customizations with their tickets. We have fulfilled ticket orders with identifying features such as custom size, custom shapes, full color foil printing and spot UV printing. As you can imagine, it is difficult to outline and price these services through the on-site calculator. Those needing ticket customizations are encouraged to submit a custom quote request form, or to reach out to our customer support team. The informed and friendly Elite Flyers custom support is available around the clock to answer your questions and provide custom quotes. To reach customer support, simply call toll-free, send an email, or initiate the live web chat feature found above. When it comes to your tickets, design is crucial for at least two reasons. Reason one: you do not want your ticket to be easily copied, and therefore it needs to be unique. Reason two: your ticket is not just an admission or invitation. It is also an advertisement for your event when others see the purchased tickets. 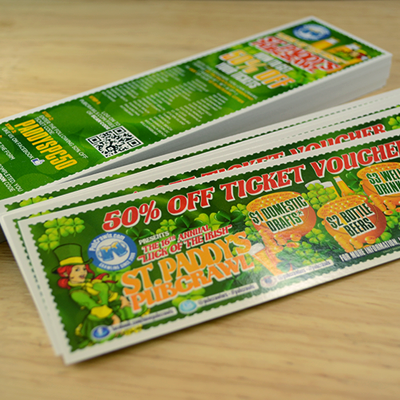 Our free downloadable ticket templates will help to get you started with your design and prepare it for printing. Nonetheless, for those wanting a low-cost yet quality outstanding custom ticket design, try the Elite Flyers design team. We can guarantee satisfaction. Click the design tab now to begin collaborating with the graphic design team. Our volume of custom design and printing work allows us to offer affordable pricing and ensures our designers are on top of their game. If your design is ready and you know your exact needs, please take advantage of the simple & secure online ordering system. Simply select quantity, upload artwork, specify shipping preferences, add notes regarding your ticket numbering, check out securely and we can print as early as tonight. The majority of our custom printing and design business is the result of previous customer referrals. We look forward to exceeding your expectations and earning your future referral. Thank you for choosing Elite Flyers for all your printing, design and marketing needs! 1 Straight Perforation 1.5 inches from Bottom or Right.